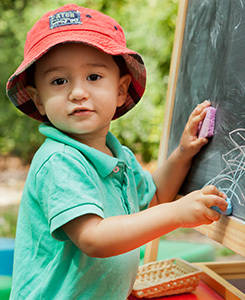 Our school offers a Toddler Program where a parent or carer attends with their child for two hours, once or more a week. The beautifully prepared environment is specific to the Toddlers ensuring it fosters the child’s growing need for independence, freedom of movement and self-discipline. Children are provided with child-sized equipment to maximise their success in their own self-care as well as care of the environment. Activities include table washing, shoe polishing, dressing, food preparation, gardening and care of animals. Children are in a sensitive period for language development during their first three years of life. Opportunities to utilise and expand language are offered through many facets in the program. One key area in the environment is our Language Area. Language baskets containing meaningful objects and picture cards which appeal to the child’s natural curiosity of the world in which they live are presented to the child to further develop language acquisition and understanding. A Language Table is also set up each term with a new theme (farm life, seascape, etc.) for children to explore and identify objects. Children ‘make sense’ of the world around them by utilising all their senses through exploration. 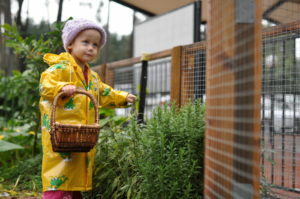 Opportunities in the Toddler Program are given to the child to explore through touch, taste, smell, hearing and sight. This is experienced through materials such as cooking activities, the nature table or through the various materials on the shelf that provide hands-on experiences. Just as a toddler is learning to walk, he is also learning to interact with the world around him. Social interactions occur in the environment as children share morning tea and participate in group time. 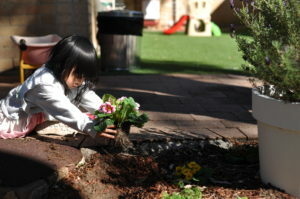 Children also learn about boundaries, respect for others and objects in the environment. These are easily seen in the program as the Directress and child greet each other with a hand shake or as the child tidies his work away each time he completes it. Over time children develop mutual respect for each other and for the learning space. Children are provided with opportunities to develop motor skills and express themselves through creative activities such as painting, pasting, cutting, drawing and sculpting. Each session closes with a group time that includes music and movement and a story.